Twice the good guys. Twice the bad guys. Twice the fun. Hello weary SAGE travelers! We’re glad you could stop by and take some time out of your day to check us out. Thanks for your support! A demo is up for you in the Downloads section to the right. There isn’t a whole lot just yet, we’re just starting off on our development adventure after all, but we think you’ll be pleased with our engine in its current state, and the playground we’ve given you to explore. So once again, thanks, and enjoy! 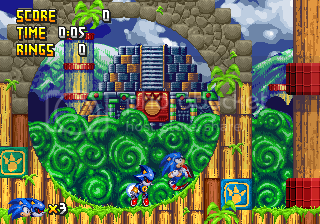 Announcing ‘Sonic Gemini’, a hot new Sonic fangame that’s sure to blow your mind … twice as much as before! Come on in and make yourself comfortable! If you look to your right, you’ll see a few links to pages showing off what we have to offer. Should make for a good time! © Sonic Gemini. Powered by WordPress and Pyrmont V2.